Hello friends. Much has happened since I last posted. Our last show with Lee Gutterman on keys happened on Derby Day at the Mammoth, a fantastic new warehouse space. Since then, we’ve picked up Brian Sweeney, of Luck Pineapple/Another 7 Astronauts on keys. We have a show booked at the Chestnut House on June 23rd with Karass and Noah Baker of Noise New York, but cops have been cracking down on the venue and they’ve been forced to cancel all shows this month. So…we are currently seeking an alternative venue. July has Parlour leaving town for the weekend of July 20th-22nd. We’re bringing along, ex-guitarist, Connor Bell to treat us with some SHEDDING music. Saturday, July 21st at the 529, in Atlanta Georgia. 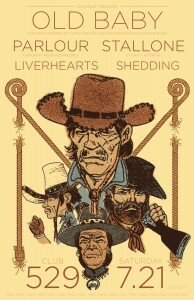 A Chunklet show featuring our friends Old Baby along with Stallone (ex-Cavity & Torche) & Liverhearts. Sunday, July 22nd at the Hiwatt Club in Nashville, TN. We share the bill with the epic The Ascent of Everest, Gold Room, and hopefully Old Baby as well.